Single Origin. Bean to bar. 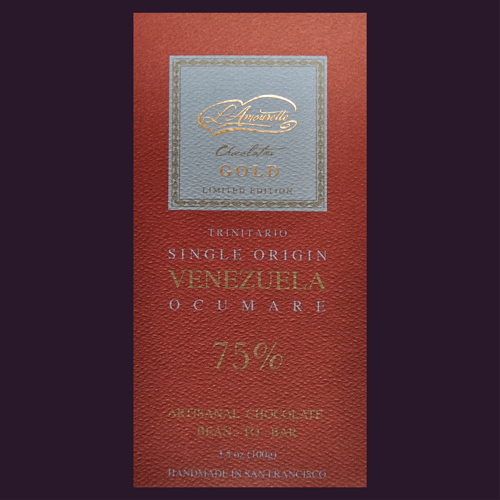 There aromatic Trinitario cacao beans are called Ocumare De La Costa. They have been cultivated and harvested for decades on small farms in the valley of Ocumare, which is located west of Caracas in Parque Nacional Henri Pittier. This park extends throughout the whole North central region of Venezuela, rewarding us with varieties of cocoa such as Chuao, Choroni, Cuyagua in Aragua State, and Trincheras, Puerto Cabello, and Patanemo (among others) in the Carabobo State. I would like to share my tasting experience with you and hope that you will appreciate the efforts to bring this chocolate to your attention. Soy-free and Gluten-free product. Vegan. All natural ingredients.